What if you could avoid the chaos and stress of holiday travel, or at least somehow feel removed from it? Well, this is exactly what many travelers have done recently to pass the time and in some cases make it enjoyable, all by dancing at the airport! With recent airline mergers, and decreased space and seating on flights, more travelers are finding themselves stuck in airports for longer periods of time. While most waiting travelers turn to hand held devices such as their mobile phones and tablets to pass the time, one can remain seated staring at a small screen only for so long. Since extended periods of impatiently waiting and sitting around can cause restlessness, and cause our limbs to literally go to sleep by becoming numb, and even cause serious conditions like deep vein thrombosis pulmonary embolism’s and other life-threatening blood clots; medical professionals stress that it is important to get up, move around and even stretch our achy, stiff limbs in those circumstances. So since it is so important for our health to keep blood flowing by moving around while in the confines of an airport terminal, what better way to do this by dancing? You get to relieve stress, minimize cramping (along with potential health risks), pass the time, and brighten the day of those around you in the process. Imagine if your delayed time at the airport could fly by or feel like being at live show? This is the case with many of the recent airport performers and their unsuspecting yet delighted audiences. Woman turns her delayed flight fiasco into a full out dance party with airport staff! Earlier this week Atlanta International airport suffered a total blackout. As one of the busiest airports in the country, the major power outage caused a complete standstill of traffic going in and out of the major hub. The sheer number of flights cancelled combined with the already busy time of year, has left thousands of passengers stranded even days later. This couldn’t have happened at a worst time, with the week prior to Christmas being one of the busiest travel times of the entire year. With so few seats available on already overbooked flights, many of the stranded passengers are projected to remain stuck in Atlanta throughout the remainder of the week. Withe the los of time, money and added frustration that such an inconvenience can cause, as well as the added tensions felt among travelers and employees alike, it is no wonder why there has been a recent surge in dancing distractions from fellow passengers turned airport entertainers. Stuck in an airport, unable to travel to her family, this girl decides to dance her sorrows away. With airport congestion and on the rise, leaving travelers stuck with no where to go and nothing to do, airport entertainer are becoming more common placed and going viral. And with tensions on the rise both in the sky and in the terminals, someone who can distract you from your troubles and make you smile in an otherwise painful situation, can be just what the doctor ordered. It’s not just fidgety travelers who are breaking out into dance numbers with waiting for flights in the airport, even employees are have been getting in on the act. An airlines ground services agent was spotted dancing his heart out on the runway as he directed planes driving past him. Videos taken by passengers on a plane taxiing right past him captured the exuberant employee performing a fairly elaborate series of dance steps (while holding his traffic control sticks) as if he were auditioning for an NBA dance team. The videos instantly went viral across social media, as well as major news channels. He has appeared on national TV shows like the Steve Harvey Show and even a morning show airing in Australia. Viewers shared their enthusiasm for the jubilant jester who worked up a serious sweat for their viewing pleasure. Many described sentiments of being distracted from their problems, feeling overjoyed, and so entertained that some wanted to get out there and join him. The wildly popular “Tarmac Dancer” puts on a show for departing passengers. Now known simply as the Tarmac Dancer, this high energy vessel of contagious positivity and his funky dance moves has some travelers eagerly looking for him when on flights passing through Rochester, New York, where he is based. Kyran Ashford, also known as the vessel of joy, has become somewhat of a tourist attraction by helping travelers to pass the otherwise arduous wait times quickly and with glee. Helping many to now look forward to traveling at otherwise laborious times with extensive and dreaded delays, this now beloved ramp dancer has helped many travelers make the best out of sometimes difficult situations. With all of the recent incidents of violent outbursts in the sky against passengers, crew and even amongst passengers themselves, it couldn’t hurt to soothe, distract or uplift them with a positive display of positive energy and ingenuity. 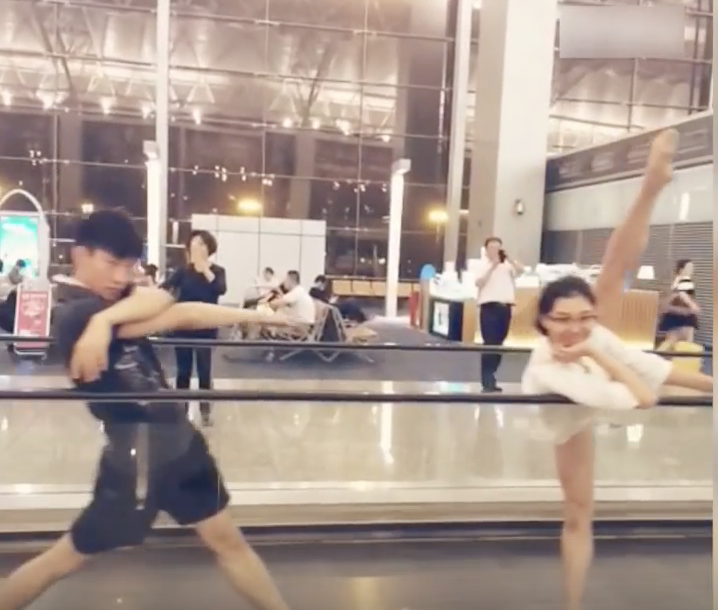 Check out following clips of regular people dancing in the middle of unexpected places like airport terminals, and see how long it takes for you to break out in a smile or maybe even dance. Then imagine how it might make your next long wait at an airport more pleasant or even fly by? Stranded ballet dancers use the conveyer belt and their skills to create catchy choreography!